Should lion bones from captive lions be traded internationally? I so, what does that mean for wild lions like this one? Image taken by Rob Thomson near the Okavango Delta, Botswana. South Africa has made some moves recently to legalise and promote the trade of rhino horn and lion bones with Asian countries, notably Vietnam and China. Whilst the pro-trade in rhino horn lobby was not successful at the recent CITES Conference of the Parties meeting (CoP17), South Africa was allowed to export lion bones from the captive lion breeding industry. After CoP17, South Africa legalised domestic trade in rhino horn (CITES only governs international trade), and has proposed to export 800 lion skeletons annually. The critical question is: will the trade in these endangered species be good for their conservation in the wild, or will it lead to their further decline? The idea of trading an endangered species under any circumstances may be appalling to some, which means the answer to this question for both rhino horn and lion bone is a resounding NO! However, the proposed trade for these two species are two rather different issues, as we will see. As with most controversial topics, the trade debate has two sides and is more complicated than it first appears. The purpose of this two-part article is to help you understand the arguments for and against trade in lion bone (Part 1) and rhino horn (Part 2), and help you judge the validity of these arguments from a conservation perspective. The lions that are earmarked for trade should all come from captive lion breeding farms, whereas the rhinos are currently kept under mostly natural conditions on large game ranching properties, where they remain part of working ecosystems. The groups lobbying for trade in lion bones are almost exclusively the lion breeders themselves, whereas the rhino horn pro-trade group comprises both rhino owners and rhino conservationists. In order to trade lion bones, lions must be killed, whereas a rhino’s horn can be removed non-lethally, and it will regrow in time. The conservation threats to rhinos and lions in the wild are very different, so any idea that purports to help conserve these species should be viewed within that context. In light of these differences, I will consider the cases for and against lion bone and rhino horn trade separately. This article focuses on lion bones. The captive lion breeding industry in South Africa is both highly lucrative and ethically dubious. The practices used by some lion farmers in the industry are akin to backyard puppy/kitten breeders that view females as moneymaking machines that need to pop out cubs at the maximum possible rate. Lion breeders in South Africa have two main options for making money from their lions. Young cubs may be removed from their mothers very early, so paying tourists/volunteers are ‘needed’ to bottle feed and raise them. Adult males are sold as trophies to people who like the idea of ‘hunting’ but don’t want to go too far out of their way, or spend too much time or money to obtain their trophy. The proposed export of lion bones will add a third string to their moneymaking bow, as the skeletons of both trophy males and their mothers can be sold to Asian markets. On ethical grounds alone, the case against lion farming is quite overwhelming, and this case has been made in the Blood Lions documentary. This poster by YouthForLions is part of an awareness campaign to stop the practice of lion cub petting. But is there another side to this story? Lion breeders have formed the South Africa Predator Association (SAPA) to provide their side of the argument and to lobby the government to keep their industry alive (there are calls to ban lion breeding altogether) and allow the trade in lion bones. 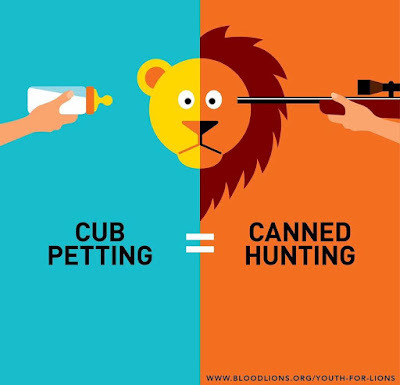 This particular association does not support the cub petting part of captive lion hunting, but does endorse the other aspects of it. From websites such as this one and online comments from other supporters of captive lion hunting, I have distilled four of the main conservation-related arguments for allowing the lion bone trade. Firstly, pro-traders argue that by supplying a substantial Asian market with bones from captive-bred lions, we can weaken the motive for poachers to kill wild lions for the same market. Secondly, the captive lion population could function as a safety net for wild lions, and provide a source of lions that can be released into the wild in places where they have been extirpated. Thirdly, they quote the exponential increase in the number of lions in South Africa since the captive lion breeding industry developed as a good thing for lion conservation. Finally, the industry is highly lucrative; if it were to be banned altogether, then people employed to look after the lions would lose their jobs and South Africa’s already fragile economy would suffer. To answer these very pragmatic arguments, we need to go beyond ethics and consider these claims based on conservation. The use of lion bones by Asian countries is a relatively new thing, as they traditionally used tiger bones for the same purposes (mostly soaked in a liquor concoction to make tiger bone wine). The tiger is being pushed towards extinction for a number of reasons, and some captive tiger facilities that supplied bones have been shut down due to ethical concerns. As the supply of tiger bones dried up, the makers of tiger bone wine looked for a suitable substitute, and discovered that lion bones will do just as well. They also found that lion bones were more readily available than tiger bones, as there was little regulatory control over what happened to lion skeletons after they had been trophy hunted in Africa. This was bolstered by the captive lion industry in South Africa, which produces far more dead lions per year than wild lion hunting. Before lion bone wine became a thing in Asia, lions faced several threats to survival – persecution due to human-lion conflict, habitat loss due to expanding human populations, and prey loss due to poaching are the primary threats; over-exploitation by trophy hunters in some countries is a secondary threat. The rapid growth of the lion breeding industry in South Africa is uncannily coincidental with the Asian markets’ sudden inclusion of lion bones in their ‘tiger’ bone wine. So much so that some have suggested that the captive lion breeding industry has actually produced this new threat to wild lion populations beyond South Africa’s borders. As with all arguments against trade, the question remains – how do we prevent the legal trade in captive-sourced lion bones from masking an illegal trade in wild-sourced lion bones? The next argument is that captive lions could potentially be released into areas where lions were previously shot out, thus functioning as a safety net for the species. While there are a few such places where lions could be reintroduced, the key question here is: do we need a source of captive bred lions to accomplish this? In a media release aimed to prove that captive lions can be ‘re-wilded’ SAPA announced the experimental introduction of several captive lions into a more natural setting - a fenced game ranch. They aim to show that captive lions can become wild again, and learn to hunt on their own. The problem with this is that even if the 'experiment' works, it fails to answer the key question above. The real answer to the question is no, we do not need captive bred lions as a source of release-able lions – there are already many wild lions located on large, private ranches, and state protected areas across southern Africa that could be used as source populations for lion reintroduction projects. Some of the smaller fenced ranches and reserves in South Africa even have too many lions for the space and prey they have available. Wild lion relocation has been done many times before, whereas trying to ‘re-wild’ captive lions is rare, and has potentially disastrous consequences. Amongst these, the consequence for human-lion conflict is perhaps the most concerning. Whereas wild lions tend to become wary around people’s homesteads and their livestock, captive bred lions have no such inhibitions. Under uncontrolled conditions (i.e. not in captive enclosures or well-fenced reserves), these lions pose an even greater threat to people and their livestock than wild lions, and are likely to be killed as a result. Efforts of relocating large carnivores are already fraught with difficulty and have the potential to fail, and using captive rather than wild lions adds one more unnecessary complication to the process. 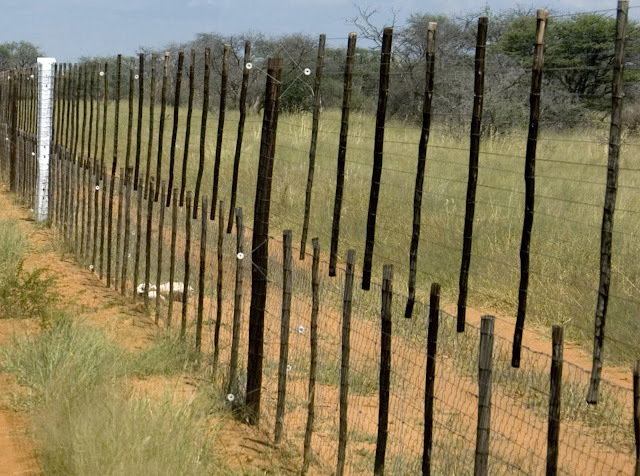 Any reintroduction project for captive bred lions requires, as a minimum, a well-fenced area that will prevent these lions from coming into contact with humans. Releasing captive bred lions into unfenced or partly fenced wildlife reserves is not feasible. Photo by Rob Thomson. Another way of justifying lion farms is to piggyback on the conservation and economic success of game ranching in South Africa. The laws of the country allow farmers to own wildlife species and benefit financially from keeping them, mainly through sustainable hunting, live game sales, and photo-tourism. In broad terms, this has led to the expansion of land that is kept in a more natural state, and vast increases in the populations of many species (including white rhinos, but we’ll get to that in Part 2). These same laws allow farmers to keep lions, but do not specify that the lions should be wild. Considering numbers only, the lion population in South Africa has skyrocketed as a result of captive lion farming, just as the number of other wildlife species has increased due to game ranching. There is, however, one key difference. Game ranching has become a lucrative form of land use that incentivises private farmers to increase the biodiversity hosted on their farmland. Farms that used to be operated under cattle only, to the exclusion of other species, have now been returned to a more natural state where several species of native herbivores (e.g. impala, kudu) take the place of cattle. This system, although not perfect, is generally good for both the environment and the economy. Only the very largest game ranches are able to support wild lion populations, as lions require a great deal of space and natural prey. Keeping wild lions on privately owned farmlands would therefore require the conservation of large tracts of land to maintain intact ecosystems. Captive lion farming, in contrast, does not incentivise the maintenance of large, natural areas. The lions on these farms do not hunt for their prey under natural conditions, but are fed carcasses by their carers. Although recent regulations require farmers to have an area where the lion can be released for a short period (anywhere between 4 and 90 days) before being hunted, these areas are not big enough to sustain even one pride of wild lions on a long-term basis. Captive lions are therefore no longer part of an intact, natural ecosystem, thus eliminating their potential benefit to biodiversity conservation. Mere lion numbers do not equal conservation success, as only the continued persistence of wild lions and the intact ecosystem and space they depend on to survive constitutes real conservation. 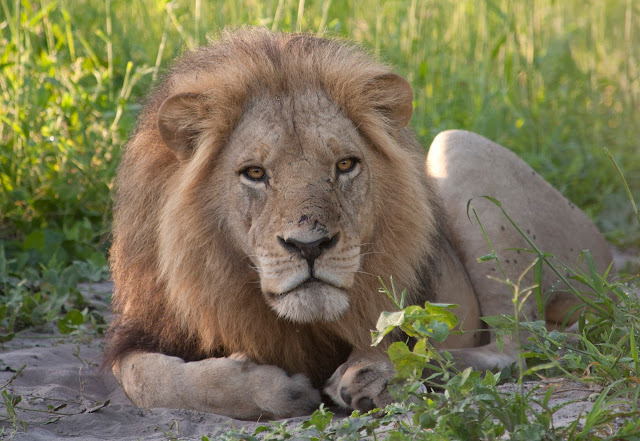 Tellingly, a recent scholarly report from lion experts throughout Africa excluded South Africa from their assessment of lion conservation efforts, on the basis that most of the lions in the country are captive. Due to their position at the top of the food chain, the 'footprint' of wild lion conservation extends beyond protecting one species to protecting entire ecosystems. Captive lions have effectively lost their conservation footprint. Photo by Gail Potgieter. The first three arguments for captive lion breeding, and subsequently trading lion bones, are on shaky ground. The only valid argument left for lion farming is the economic benefit of the industry. Intensive lion farming is certainly more profitable than maintaining and protecting the large swathes of natural habitat required to host wild lions. This begs another crucial question: if game farming in South Africa is to be based purely on economics, then won’t the trade from captive animals (trophies and bones) eliminate the current incentives for game ranchers to conserve natural ecosystems? Whether or not economic benefit alone is worth allowing the lion farming industry to continue is an open question. From the recent actions of the South African government and the CITES allowance for captive-sourced lion bones to be sold internationally, it seems that their answer is yes, we should let the industry continue. Now that you know all the arguments, what is your answer? Conserve Botswana magazine aims to forge a mutually beneficial relationship between conservation biologists and the wildlife-based tourism industry by informing and engaging with an international audience of wildlife enthusiasts who visit Botswana. This blog will cover latest news and hot topics in conservation, written by conservation scientists working in Botswana.